Two weeks ago tonight I sat at the bar in the Ace Hotel lobby in New York, considering the question that all gourmands ask when they find themselves in a city in which they are not a native: where do I go to eat? If only there were a better way to find out where my New Yorker foodie friends have eaten recently. Few of them post reviews on Yelp. Foursquare?s ?Explore? tab is a mash-up of recommendations based on where people I know checked in, new places that have opened, and the ubiquitous places that are ?popular.?? There was simply no easy way to find out where my friends who have a similar taste in taste go to eat. Until the next day, when Facebook announced Graph Search. A lot of ground has been covered on the specifics of Graph Search already (see Forbes, CNN, and Gizmodo for excellent divergent opinions), but it?s important to consider the bigger picture because I believe it is the first major step in the next direction of discovery on the web. What Facebook believes – and several studies validate this belief – is that the people we trust most are the people closest to us, regardless of whether or not those people happen to be the most trustworthy or not. 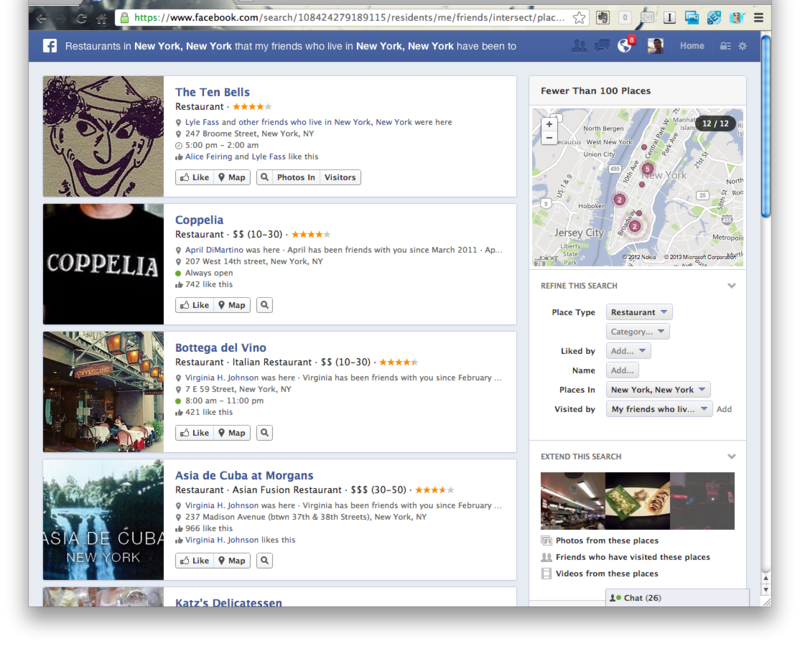 Until now, the only way Facebook enabled discovery of restaurants visited by those closest to you was via serendipity. ?You happen to see your friends check in to various New York restaurants in your news feed or by visiting the timelines of the friends you think enjoy similar culinary experiences as you do. Graph Search changes that by allowing you to search, in a more linguistically structured way, for restaurants that your friends have been to in New York City. For now, possible searches revolve around people, places, interests, and photos. The results are contextual; searches for restaurants show the restaurant rating (another Facebook beta product only available to limited users), the friends who have been there, and the friends that have liked it. Results for a search for people by employer show a mini-resume card; searches for single women highlight relationship status.? Photo search results come back as a mosaic. Restaurants in New York City my friends who live there have been to. Apparently, all of my New Yorker friends are immigrants. One of the first things you notice when you turn on Graph Search is that queries are highly structured. This structure is contrary to the way we’ve been conditioned to search the web over the last twelve years; typing two or three keywords into a Google search box is often enough to get the results we need. 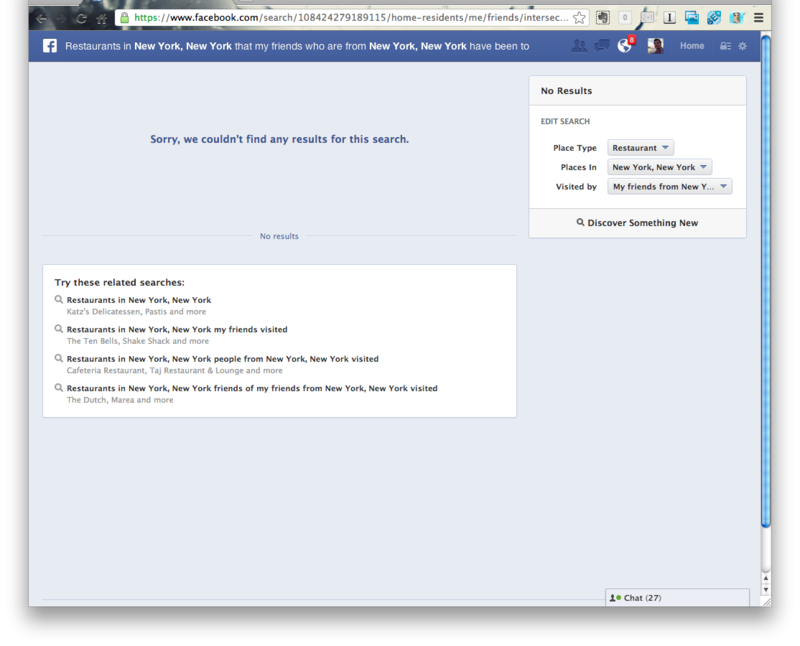 Facebook seems to have understood this, and as a result they provide search suggestions as you type. Aside from the convenience of not having to type full query sentences, the suggestions serve to educate users as to what is currently searchable. This small design choice illustrates how transformative this search can be – you literally discover things you didn’t know you could discover as you type. The backlash that Facebook faced after announcing news feed in 2006 was because users thought that the social network was exposing private information. This wasn’t the case, of course – Facebook was simply making it easier to see information that was already public on user profile pages. The same “privacy” concerns exist with Graph Search. Depending on your privacy settings (which Facebook has greatly improved over the last year), you are likely to show up in other people’s search results based on what you’ve liked and checked into. But you’ll likely only show up for people you know – which is precisely the reason why Facebook Graph Search works so well in the first place. At the same time, it might also inspire people to do more on Facebook. A restaurant check-in on Facebook is no longer simply a notification of location presence that appears in the news feed of those friends that Facebook believes would care about it the most. It’s a way for people to vote for a restaurant with their feet and their smart phone. 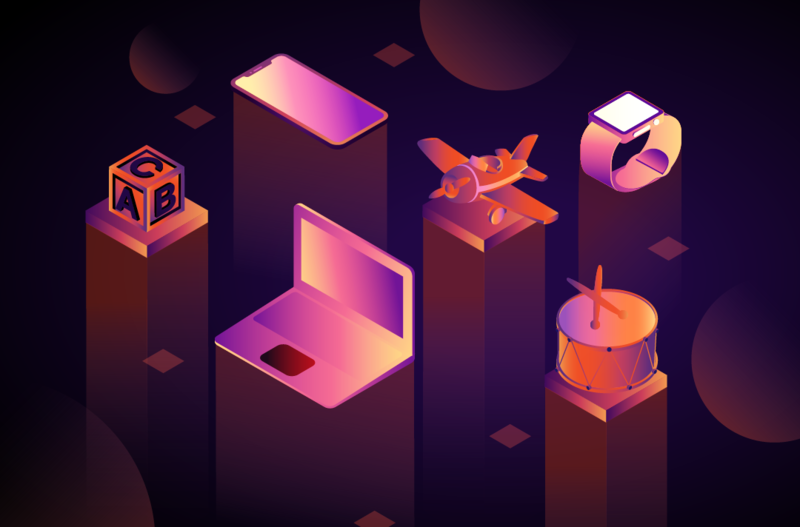 In any form, search is and always will be a way for users to discover brands, businesses, and products. ?As far as discovery is concerned, Facebook and Google Search are remarkably similar: Both Facebook and Google rank ?results by matching search intent with information authority. The difference is in how Facebook Google measure authority. Google measures this authority by looking at how content is connected across the open web. Facebook measures it by how the people you know interact with the people, places, and things they know. 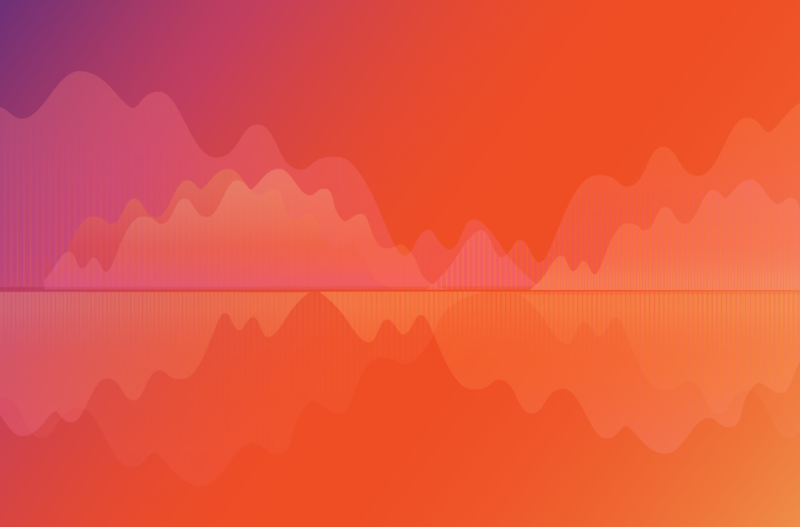 The recent change to Facebook’s GraphRank algorithm – the secret sauce used to determine what appears in each user’s news feed – that emphasizes page engagement over page likes becomes much more important now. The legacy of brands focusing on the quantity of page “fans” – gained through tactics like “likegating” contest entries and paid fan acquisition – is over (though some might disagree). Now, the level of engagement on your Facebook Page (or in your app) determines whether or not your message will be seen by your fans. It seems that this same algorithm (or a version of it) determines search results ranking. If it hasn’t been before, it should now become a priority for brands to drive quality, natural engagement on their Facebook page. Graph Search search is limited to results within the Facebook walled garden, but that could change quickly as graph search rolls out to the masses, and brands who have the opportunity to link their sites and applications with Facebook should take note. Facebook Graph Search doesn’t currently understand the query “friends that have been to see the Lumineers.” But Ticketmaster has integrated Facebook Open Graph into their website for some time – when you buy a ticket to a? show, you can tell your Facebook friends that you’re attending and where you are sitting. Facebook understands the action “attend” already, just like it understands what you “listen” to (through music apps like Spotify and Rd.io) and “watch” (through integration with services like Hulu). As long as these and other social-centric services are connected to Facebook Open Graph, I would expect that Graph Search will index these actions in the same way they’re indexing what you like and check into now. Here’s another way Facebook and Google are similar: Both companies make money by advertising. Where Google ads are targeted based on search intent, and Facebook ads are now targeted on connections. 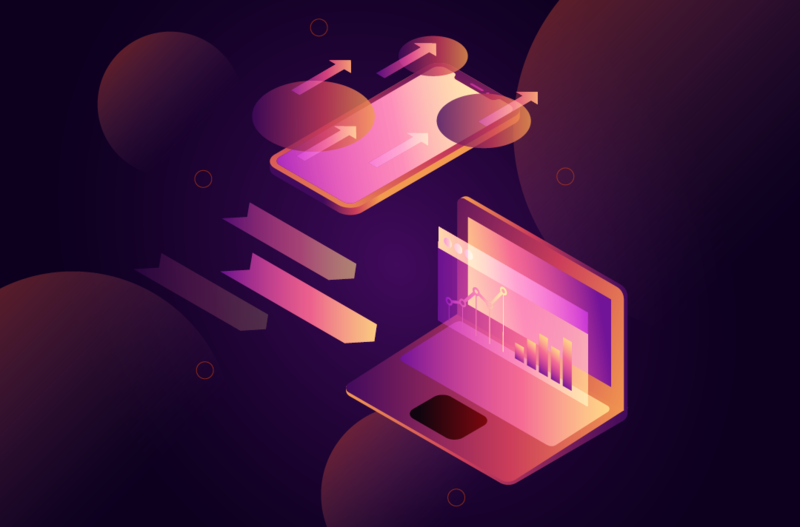 With Graph Search, Facebook can now target ads by both connections and intent, which may turn out to be the key to making Facebook advertising much more valuable. Meanwhile, while singles sites like Match.com might be concerned that fact that a single man in Brooklyn can now search for “friends of my friends who are single women in New York,” Match can then advertise to single men in New York who are looking for single women. The content of the ad can be created with the intent in mind, which will likely increase the engagement – and value – of that ad unit. Meanwhile I’m in New York again, and I’m looking forward to trying out The Ten Bells tonight, the top result on my Graph Search. Apparently, there’s no sign above the door. Hopefully I can find it, but I’m not worried. Sometimes, the joy of discovery is in the search itself.